What’s it about? Walter Mitty (Stiller) is an unremarkable man who frequently finds himself day dreaming about a life much more exciting than the one he is living. When he gets a new boss (Adam Scott) and his job is threatened, Mitty is spurned into taking action in the real world – leading to adventures more extraordinary and invigorating than he could have ever dreamed of. Verdict: The Secret Life of Walter Mitty really could have gone either way; life-affirming and ‘inspirational’ films are as make or break as they get and can be a disaster if they go wrong. 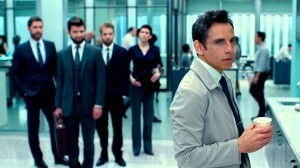 Walter Mitty is a likeable enough character, the film opens with him meekly attempting to send a ‘wink’ to his love-interest and colleague Cheryl’s (Kristen Wiig) eHarmony account before realizing that his profile, void of any interesting or exciting stories about his life, is too empty to classify. We then follow him to his place of work, Life Magazine, where he’s ridiculed and belittled by the hotshot, new boss before resigning to his desk to develop the photo that will make up the front cover of the final edition of the magazine only to find that it’s missing. All-in-all, it’s hard not to feel for the guy. Seemingly so resigned to his unremarkable life that he frequently zones out into vivid daydreams where he’s the confident hero that saves the world rather than humdrum Walter Mitty. The daydreams provide a real insight into Mitty’s character and although entertaining at first, they became more and more frequent and start to disrupt the flow of the film. However, once Mitty’s real-life adventure begins after half an hour or so, the daydreams cease almost entirely making the film a lot smoother and allowing you to relax into the story. Mitty’s search for the missing photograph takes him on a whirlwind adventure around the world – he’s soon climbing mountains, escaping erupting volcanoes and even survives a shark attack. All of this happens in the midst of visually beautiful scenery, creatively utilized in unique and clever ways to give that film a little something extra, and subtle but great comedic moments that make the 2-hour run time pass with ease. Walter Mitty’s growing confidence as the film progresses makes for a really fulfilling watch as Ben Stiller effortlessly leads the film. His relationship with Cheryl develops in a sweet and endearing way but the love story is in no way the focal point of the film. It’s more a journey of Mitty’s personal development and self-discovery as he goes from having nothing interesting to say about himself to having more stories than he could ever need to verify an online dating account! The Secret Life of Walter Mitty can be quite predictable at times, he whereabouts of the missing photo was almost overwhelmingly obvious for example, and it definitely isn’t in the same league as Forrest Gump and Life of Pi. However the film is incredibly feel-good with humorous undertones and an undeniably heartwarming conclusion that will have you leave the cinema with a warm and fuzzy feeling. Final Words: Walter Mitty is by no means Forrest Gump but the film is enjoyable and heartwarming nonetheless. If you’re willing to suspend your disbelief ever so slightly then you’ll be in for a real treat this festive season! 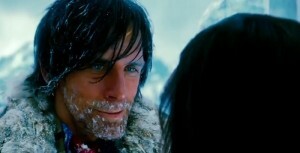 The Secret Life of Walter Mitty (PG) is released in UK cinemas on 26 December 2013!